Hotel lawyer on hotel industry trends. What’s the price of gasoline have to do with the future of the lodging industry? Some pretty interesting research tells us “More than you might think”! I was quite surprised by the number of www.HotelLawBlog.com readers who sent me emails commenting on that recent blog. It is always nice to know that so many of you actually read these postings. But several of you wondered out loud — or commented — that you thought the cost of petroleum or perhaps some other items might also have a strong correlation with the lodging industry. As to the impact of petroleum prices, there is a strong correlation. As to other factors, there appears to be little or no correlation. So the price of gasoline actually does have a lot to do with the future of the lodging industry. How much impact? Let’s take a look. My expert for all these matters is Bjorn Hanson, Ph.D., principal and practice leader with PricewaterhouseCoopers. I regard Bjorn as an industry friend and colleague, and he was kind enough to share his graphics with me. But today we want to go a bit further. PwC notes that when gas prices were at $.98 per gallon, and other consumer price segments stayed stable, lodging demand decreased. 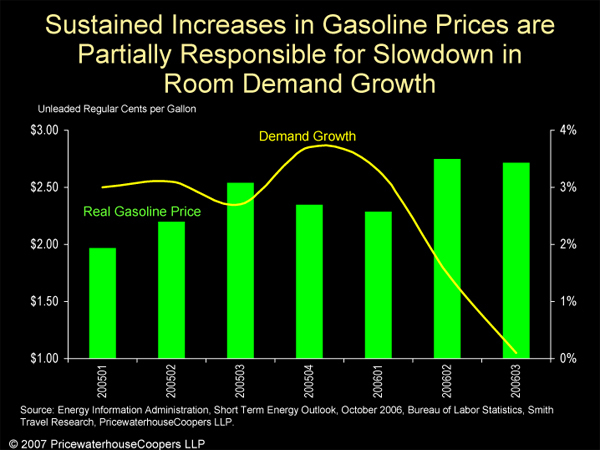 So gas prices did not affect lodging. However, in recent times, PwC has calculated that when real gasoline prices increase by 10 percent, lodging demand declines by 0.41 percent. The following charts illustrate the significance of gasoline prices on lodging demand and the fact that virtually no other consumer segment had any seeming correlation with the lodging segment. 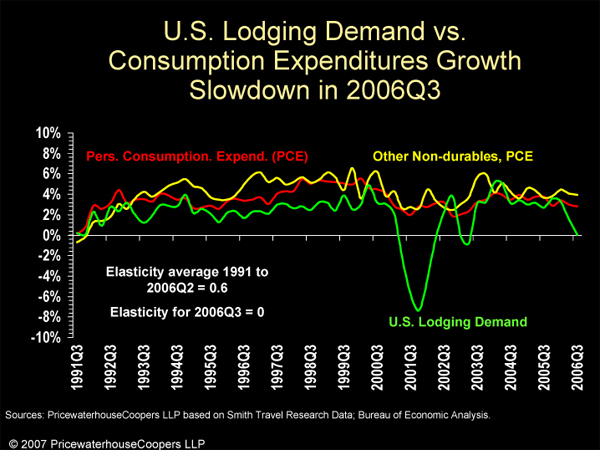 In other words, other than changes in the supply of hotel rooms, or changes in the real GDP, gasoline prices may be the next most significant indicator of changes in the lodging industry’s fortunes. So, it would seem that the practical answer to the original question posed, is that — at least today — gasoline prices have a significant impact on lodging industry demand, and have to be seriously considered in evaluating the future of the industry. In the next few days, I will be reporting on the developments at the industry’s leading hotel development conference — The Hotel Developers Conference™, in Rancho Mirage, California on March 7-8, 2007, where all of the industry leaders will be. Walk in registration is available if you haven’t signed up yet. Stay tuned for the reports!